Daniel Diehl is the author of more than 20 nonfiction books and five novels including his acclaimed Merlin Chronicles trilogy. He has also written scripts for more than 170 hours of television documentary programming. His work has been translated into eleven non-English languages. His latest book is the nonfiction ‘Apparition Atlas: The Ghost Hunter’s Travel Guide to Haunted America’, will be released in September 2015 by Ravenswood Press. Mr Diehl posts a weekly blog about writing and books on his Facebook page. Inventors & Impostors: A Sordid History of Innovation and Imitation by Daniel Diehl and Mark Donnelly is a collection of stories depicting the circumstances in which many of the modern wonders which we all take for granted really came into existence. It begins with the twists and turns of the telephone, the real story, which in September 2001 caused the US Senate to pass a resolution stating that Antonio Meucci, an Italian by birth and a naturalized American citizen, had invented the telephone. More such stories then follow, dethroning Henry Ford as well as Karl Benz from the first automobile, Columbus from the discovery of America, Darwin from the Theory of Evolution, and Edison from the light bulb, being only some of the rather shocking reactions these pages are bound to cause. 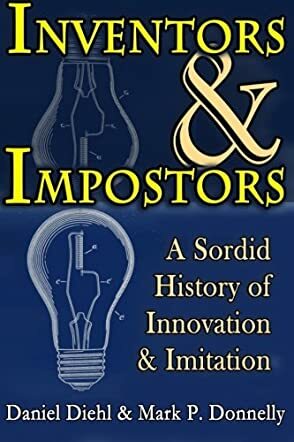 Inventors & Impostors: A Sordid History of Innovation and Imitation by Daniel Diehl and Mark Donnelly is a well researched work. At least some of these had been known to me through other sources, some of them even proclaiming that an invention actually takes place when it becomes inevitable, or when technology lurches forward on its own inertia as "a self-propelling, self-sustaining, ineluctable flow." This anthology includes a good array of important inventions and discoveries, capable of surprising even the well read. The events described in this book also indicate that no one man could be expected to invent the various constituent parts as preliminary steps to making the culminating invention. Daniel and Mark have produced quite an extensive collection, mostly of well known and popular discoveries to drive this idea further.